Hello! What are the options for studying in both Berlin and Paris? My question is about learning French. Say I am coming there with A1 Level. 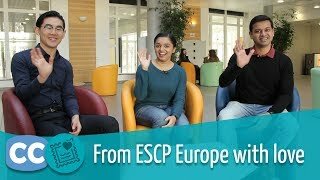 Does ESCP provide any French class for an International student like me? Can I learn A2 level at your campus? Hello, what kind of internships or jobs have previous students landed in the program? Hello professor, I am a candidate from India. For international students, are there any specific number of positions reserved per country? I had a look at modules under data science part for this masters and found no python. Python being the number 1 language for data science/big data is not offered in this program. Can you explain why, please? How are the courses organised in 2 countries? languages? teachers? credits? Do some of your students go towards data science jobs or they all go to data analyst positions? What kind of salaries do your graduates get? This would be a degree of M1 or M2? Hello, if I graduated successfully from your degree program, how long can I stay in France and Germany respectively to find a job or to work? What are the prospects of finding a job outside France? What’s the agenda for the seminar Beijing? Are there extra costs associated? Could you shine some light on the amount of projects and case studies we can expect? GMAT/GRE is not a requisite but a plus to have. If there are 2 students with similar profiles, one with a GMAT/GRE score and one without, who would be given preference? How important is a statistics background?